Describe the details that jump out at you. Describe the details that emerge from closer inspection. Try NOT to interpret the details. You are describing how the work literally appears and/or what it contains formally. Pretend you are describing the work to a friend who has never seen it but needs to find an exact copy. To an extent I would call this piece “not conventional art. Meaning, walking through the Whitney this work stands out as a very straight forward, yet overwhelming informational work. It is a giant foam board with facts on the affects of workers in different industries. Consider your initial impressions. What assumptions might you be bringing to your observations? The piece is intriguing as it is very graphic. Although, it’s not that exciting to the eye as it looks more like a “science fair” presentation vs a work of art. 2b. What mediums/materials were used in the artwork? How is the medium/material used to express, hold, support, and/or reinforce the content? Photomontage of gelatin silver and chromogenic prints. Explain, how do the various materials cohere? How do text and graphics work together? Collectively, how does the work relate to the other items in the exhibition? The materials used serve the message nicely. Meaning that since this is an informative piece, it was presented in a very static and graphic way. However, this piece stands out from the rest of the pieces in the No Idle Gesture room within the exhibit as these graphic photographs don’t really go along with the other art. However, this exhibit was very informative and graphic so the piece ties in contextually vs. aesthetically. In which period were the materials produced? Provide facts, not just opinions, to situate the work within its historical context. What additional information would help you to understand and interpret the work? This piece was made in 1976/1978 during a time of where new information was being spread and labor was still hard and not digital. People worked more with their hands, and stood longer hours than the desk jobs that the majority of people have nowadays. It seems from the piece, that the affects labor had on people were not looked into at the time. Whereas now labor unions and safety regulations are set to ensure the safety of the workers (in some places around the world at least). 4a. Create a minimum of 3 questions about the artwork you have selected. They should help you understand something important about the issue the artwork is addressing, expressing, reflecting, and/or responding to. This issue should then connect to the Issue you have identified for your own Research Paper and Project. 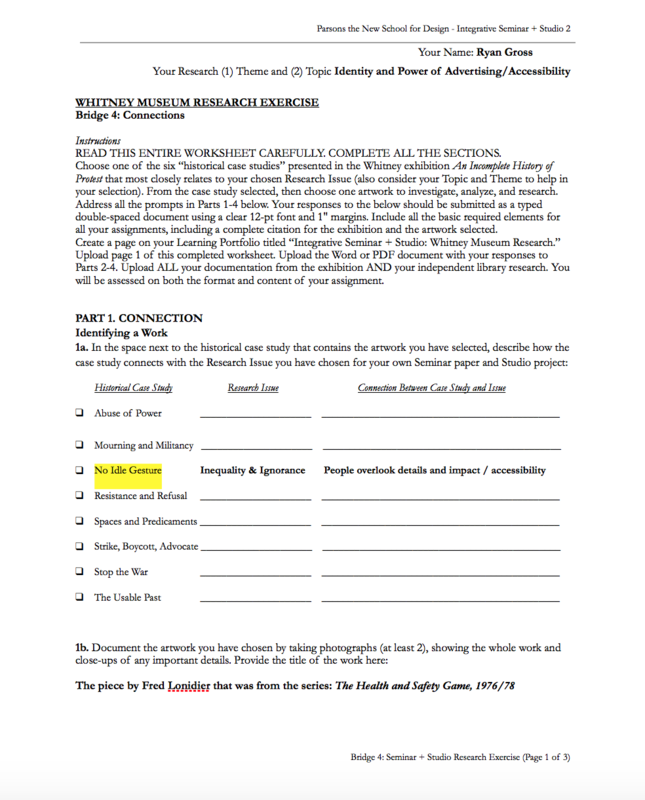 For each question, include a brief (3-4 sentences) explanation of your question’s relevance for understanding or analyzing the importance of the artwork AND how it connects to your own Research Issue. Thus, you should provide 3 paragraphs, one for each question you have generated to understand the artwork. What is the significance of this piece? This piece provides insight into the way workers (and people) are overlooked. Details are important and realizing impact and messages are important as well. This piece graphically shows the context in which people are experimenting the bad work environments they were put in. What can this piece tell us about accessibility? Since I am looking into the way accessibility is taken into consideration when it comes to design, this work gives a bit more insight into the details that weren’t considered when creating/designing systems. The idea of this piece will help contextualize my research for my final research paper. What can this piece teach about the world? Attention to details is important. Many times, the simplest bits are missing form a system, and creators hold the responsibility to think beyond themselves and into the lives of many types of people. There are many flawed systems within society, and this piece further ensures that idea. 4b. Seminar-Specific Assignment: Library Exploration II. Go back to the Library. Select the most important question of the 3 you composed for Part 4a. Go back to the Library (this is not a typo, but a reminder that you MUST conduct this research AT THE LIBRARY). To address the question you selected, you must find BOTH (1) an article from an academic journal AND (2) a chapter from an academic text. To find the article, conduct an online search via TNS library databases (recommended databases include JSTOR, ProQuest, and EBSCO). If you do not know how to access these databases, then ASK A LIBRARIAN for help. Take screenshots of the search results showing the database searched and the search query you used. From your search results, download the article that best addresses your question. Your New School login grants you access to these articles, to which you also get direct access from library computers. Print a hard copy. Keep this hard copy – you will need it for next week’s assignment. To find the chapter, conduct an online search via TNS library books or NYU’s Bobcat portal. Take screenshots of the search results showing the query used. Using your search results, find the book at the library that best addresses your question. Take another photo of the library stacks where the book is located. Check out the book and/or scan the chapter from the book. Print a hard copy. Keep this hard copy – you will need it for next week’s assignment. 4c. Studio-Specific Assignment: Artist Monograph Research. Research what the artist was working on right before and immediately after they made the artwork you selected from the exhibition (provide dates and titles for the artworks found). This research will require that you either check out a book from the library (as a New School student, in addition to the three New School libraries, you also have access to NYU and Cooper Union libraries) or go to The Strand Bookstore. The type of book you will look for is called an Artist Monograph. These books focus usually on only one artist and their work. You will get much more thorough information from an Artist Monograph than from what is available online only. Document the book(s) you find by photographing the cover, copyright information page, and individual images inside. Upload your documentation to your LP. 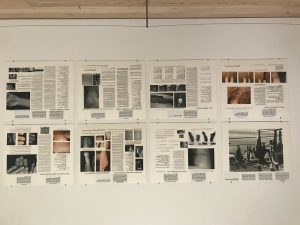 Reviewing your findings, provide an explanation in your own words about what the artist was visually exploring with their work. You may discover that the museum piece is a “one-off” or part of a continuum of work. If it is a one-off, look for connections (that may or may not be obvious) to the artist’s previous and post works. 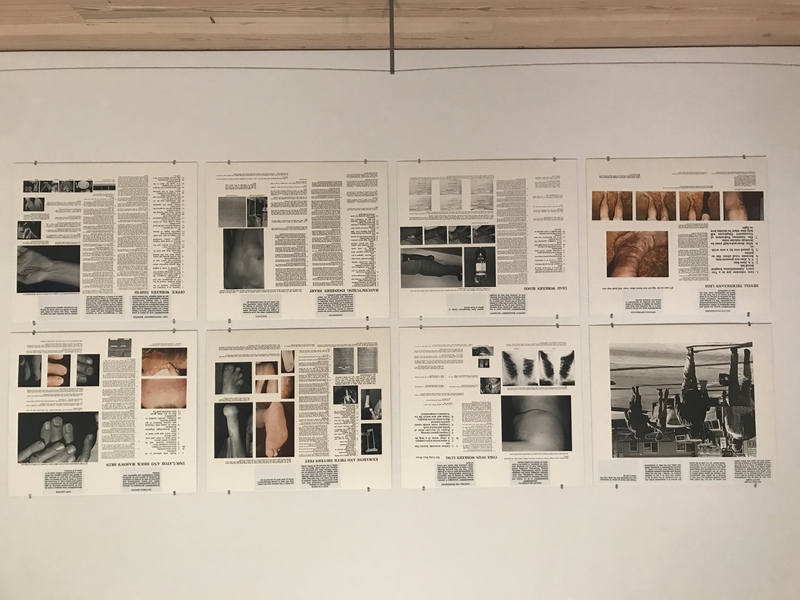 Whether the artwork is part of a continuum or a one-off, what did the artist do that was different with this particular piece that made it stand out enough that the Whitney chose to include it in this exhibition?